Is a day trip from Toronto to Niagara Fall worth it? What is the best way to travel from Toronto to Niagara falls and is there a bus to Niagara Falls from Toronto or do you have to get a car? This post addresses these are other practical concerns we had before we took a day trip to this natural wonder. 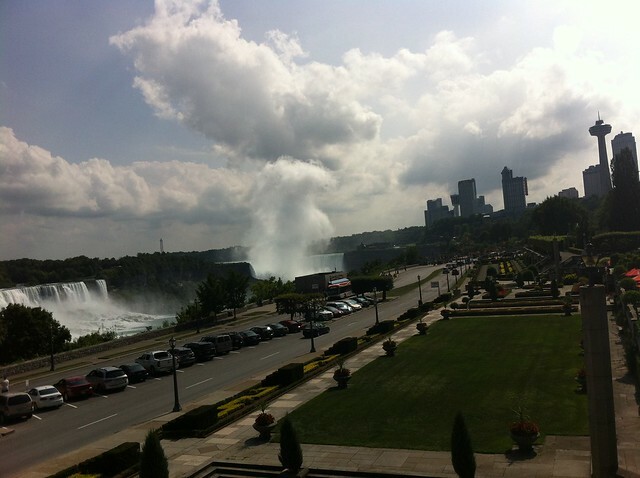 Our day trip from Toronto to Niagara Falls was one of the highlights of our summer in Canada. I had always dreamed of seeing the falls, but I had always worked on the assumption that they were a remote natural wonder requiring preparation and planning to be visited. As it turned out, I was wrong. 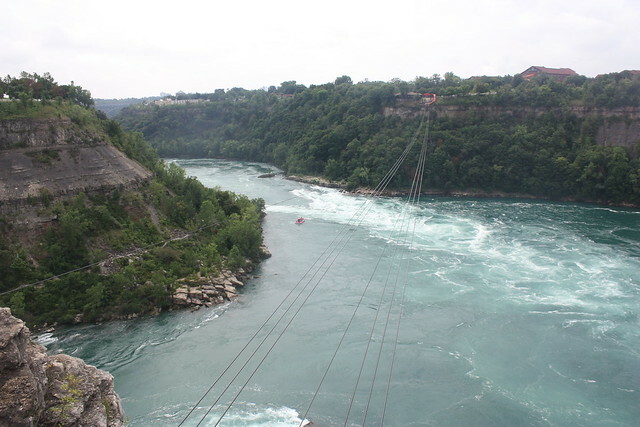 The Niagara falls are within easy driving distance from Toronto and they are reachable by car of with organised tours. What is the best way to travel from Toronto to Niagara falls? 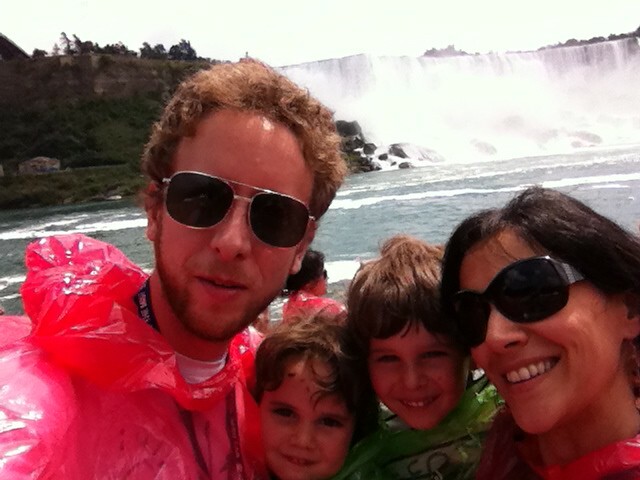 With kids, the most comfortable way to reach Niagara is by car. The falls are about 130 KM from the city and can be reached in about 1.5h. Bus tours usually stop in Niagara on the Lake (see below) which is a lovely quaint city with souvenir shops, boutiques and ice cream parlours: it is worth a visit but, if driving, be careful about the parking sign – paid on-street parking is expensive but rules are enforced and fines are steep. If like us, you prefer not to drive, there are many services offering organised day trips by coach or mini bus. 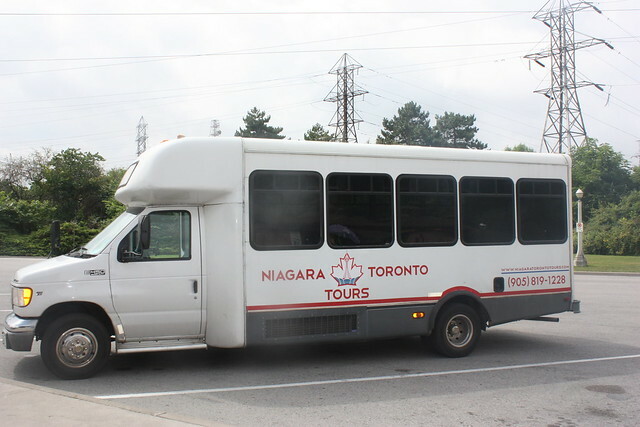 The organised buses from Toronto to Niagara Falls tend to all follow the same itinerary and this includes as top in Niagara on the lake, a local winery the floral clock, the vortex and of course the falls themselves. Is it worth paying for the day trip to Niagara falls? To be honest, it depends. While we had no complaints about the tour we chose, going back I would probably prefer the flexibility of a private car, skipped the winery and the floral clock and spent longer at the falls. If you are travelling with older kids or are on a budget, you can also catch a bus to Niagara falls from Toronto Bay and Dundas stations. At the time of writing, the companies serving this itinerary were Coach Canada and Greyhound. 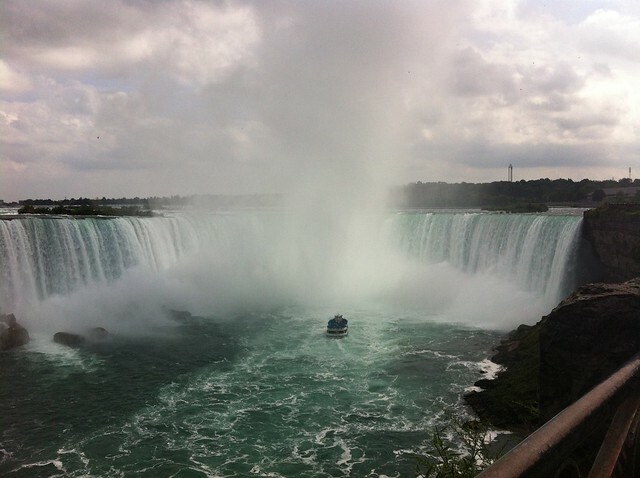 We had debated long and hard whether we should go to the Niagara Falls by rented car or with an organised tour and had eventually decided for the latter. We had booked our day trip on the web, from one of the many companies offering Toronto to Niagara falls bus tours (we chose Niagara Tours): we got attracted by the comfort of the hotel pickup and drop off and by the varied itinerary, that promised to show us to the falls, of course, but also a winery, the town of Niagara-on-the-lake and a much talked about flower-clock. This Niagara falls bus tour was all we had expected: it to be and brought us on time to all the destinations listed and had a pleasant guide who did his absolute best to entertain a particularly grumpy crowd! The easy email booking system meant we had made all arrangements in the day before the bus tour and the offer of a child seat for our daughter was a nice touch. And so, full of anticipation on an overcast Canadian morning, we joined the rest of our party, taking our seats in the sleepy atmosphere of the early ride. The kids half asleep, we drove out of the tall Toronto skyline and soon we found ourselves over flatter countryside. The sun had come out and, as the morning progressed, we slowly awoke to a beautiful land of agricultural fields, fabulous mansions and vineyards: we were in Wine Country Ontario. Until we went to Canada, we had no idea about the wine production of this region, but Ontario is the home of over 100 wineries and its production is as varied as the number of producers suggests. I like wine, but my (limited) knowledge mostly covers Italian wines, so I was delighted to widen my wine appreciation horizons, especially since I heard of a wine with a name that intrigued me: icewine. Icewine is one of Ontario’s treasures: it is wine produced from grapes left to freeze naturally on the vine and the experts described it as luscious, aromatic, sweet but with a backbone of acidity that makes is perfectly balance. My non expert taste would definite it as: delicious. 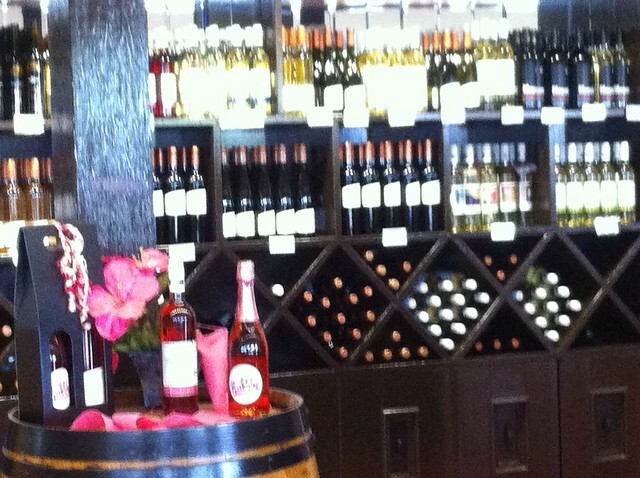 We learned all about this wine on our first stop, which was at a local vineyard and included a wine tasting. The bus tour dropped us at the winery shops, an elegant outlet surrounded by a beautiful vineyard, where they treated us to a taste of their best wines (the kids got grape juice). We sampled three varieties: I truly enjoyed them and probably would have even ordered some bottles for shipping, if I hadn’t found them badly matched with my morning latte. The visit was our first stop of the day and I can’t help but thinking how much better it would have been to get there at the end of the day. I imagine the vineyard would have been beautiful at sunset and a glass of wine shared with the companions of a day at the falls, would have been a great way to wrap up the trip. But that’s what happens with pre-scheduled tours: the comfort sometimes means a compromise on your ideal running of the day. Our party anyway seemed to have different views on this and, orders placed for worldwide shipping, we were on the go again. The following three stops included the flower clock, a non-descript fast food/restaurant and the lovely town of Niagara on the lake. I had first heard about Niagara on the lake during a casual conversation with a woman sitting next to me on a plane journey in Europe. We were chatting about my upcoming trip to Toronto and she said I had to see Niagara on the lake as it was ‘Christmas town’. As soon as we got there, I saw was she meant. Niagara on the lake is a super cute town that seems to have jumped out of a postcard. Quaint shops selling crafts, old-style ice cream parlors, white fences: you almost imagine white horse carriages to come from around the corner. The kids enjoyed it immensely and reacted to it as they would to a fairy village, with the added advantage of an abundance of (delicious but overpriced) ice cream and gorgeous looking macaroons. We adults also enjoyed the cute surroundings, even in the short 20 minutes we had: Niagara on the lake is a pretty, picture – perfect town, and the adjective that comes to mind to describe it is the same often used in its official tourist materials: lovely. Our eyes full of flowery windows and stomach of delicious ice cream, we got back on the bus, finally ready to see the waterfalls and their uncompromising power. As you get closer to the falls, the bus stops become more frequent and you start slowly perceiving how powerful nature is in this otherwise wealthy and peaceful part of the world. 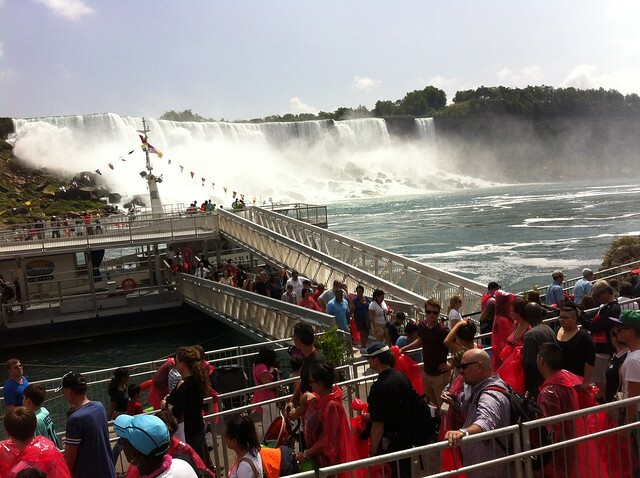 Toronto to Niagara falls bus tours: getting closer and closer! the Niagara falls are one of the most, if not the most amazing natural feature I have ever seen. I found them beautiful, powerful, awe-inspiring and I know that if I could see them every day I would never tire of them. We caught a first glimpse of the falls from afar, at the drop off point of all bus tours. There, two roads meet: on you right the one leading to the city, with its skyscrapers, bars, hotels and entertainment joints. The other, a long scenic walk along the high banks of the river, at the end of which the waterfalls beckon, glimmering in the sunlight. The name Niagara Falls comprises three different falls: American Falls, Bridal veil falls (divided by a strip of land called Luna island) and Canadian Horseshoe falls, the biggest of all, at the far end of the photo above. The horseshoes Canadian falls moves 2,271,247 liters of water per second, but this number didn’t mean much to me until the moment I first set my eyes on the fall and the cloud of water its power lifts over the river. The enormity of this number only started to make sense to me as I walked towards the belvedere and then when I found myself face to face with the water. By far the best way to see the falls and appreciate their power and magnitude is to get a ride on the ferry. Our ticket was included in the cost of the bus tour and so, after seeing the falls from above, we were ready to get wet (literally) and joined the cheerful crowd of tourists ready to board the ferry. The ferry has the evocative name of Hornblower. It has open decks and when you board you are given colorful plastic overalls. I can’t urge you enough to wear them: they are not the most protective of gear, but looking at the soaked, laughing faces of the crowd who got the tour before us, we knew the falls would touch us in more than one way. The boat ride was the highlight of our day. Slowly, the ferry brought us at the bottom of the first two falls, the ‘small’ ones. Then it slowly moves to get close to the bigger one, the horseshoe one. Here is where the soaking really begins and for the first minute, in our case, where the screaming of the children reached its climax. Our boy screamed and laughed at the same time (‘Guarda mamma!’), while his little sister screamed in terror and calmed down only burying her head in my chest. Reassuring her meant that I got distracted while we were approaching the fall and when I suddenly lifted my head up to see where we were, the falls was towering over me, its might so vast it took me a while to take it in. I left the ferry giddy with excitement and humbled by the power of the water. I knew no other moment could match the power of that ferry ride, but the rest of the day was nonetheless pleasant. The waterfalls area is made for tourists and it’s easy to enjoy the view, rest on the lawn and browse the souvenir shops. Soon, it was time to get back on the bus. 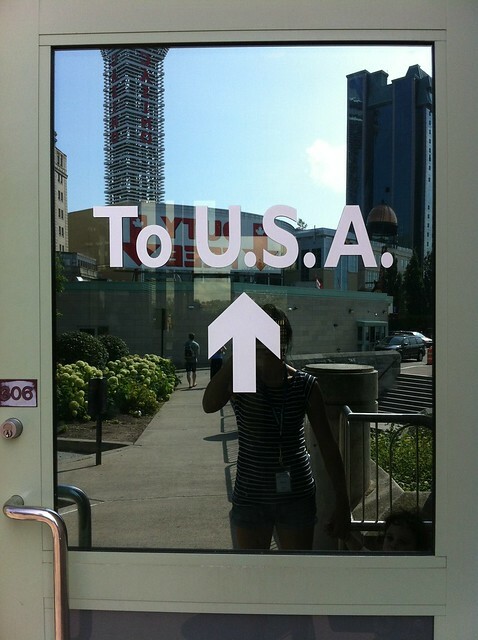 Just before boarding the bus again, we noticed a flight of marked with a small, inviting sign: ‘to the US’. We climbed and found ourselves in front of a locked door marked with the same words, opening onto a long bridge crossing the river into American territory. We had no time and no visa to cross over, but the seed of another family adventure was planted.